What a great idea, a chart for websites that have been designed well! It rates them as the Top 40, similar to the Billboard charts. 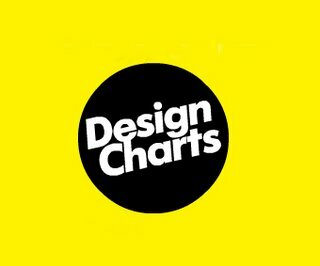 The Design Charts are done pretty light heartedly and include last week and peek positions. Also a cool way to check out some cool sites. Susan Bradley, based in the UK, has created some really cool Outdoor Wallpaper designs. 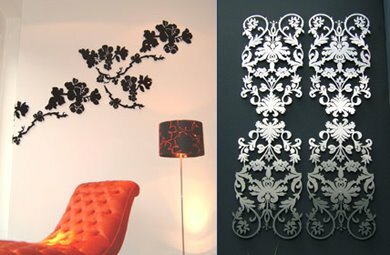 These cut out patterns are produced in various materials and can be used as a flat decorative element on screens and garden walls. I particularly like the one titled "vine". How cool is this fabric...well I thought it was awesome. 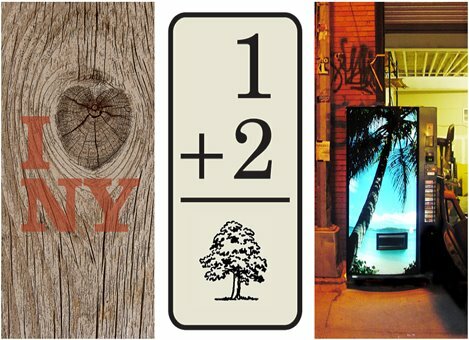 It comes from Tonic Living, located in Toronto Canada and run by a local family. They have some great designs if you have little time to browse through them. From futon covers to decorative ribbons. An apartment in the city will often have limited space for our green air giving friends. Rephormhaus has invented the Steckling to rid our apartment blocks of green plastic boxes on rusty hooks. The Steckling saddles a railing or balcony wall and provides the potter with two areas for versatile planting. You are probably saying, "What in the world...?" Well, Sixixis is a trio of recent design graduates specialising in Sustainable Design. 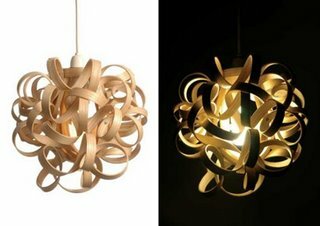 Locally available wood is turned into new inventions in 3D wood bending. What amazing work, I love the lamps! How cool are these chairs from Moroso. 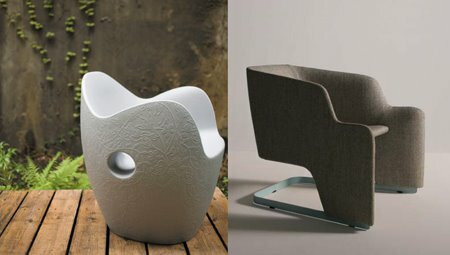 The nest chair on the left is by Tord Boontje and comes in an array of colours. Do yourself a favour and browse through the chairs and sofas available on this site, super cool things. 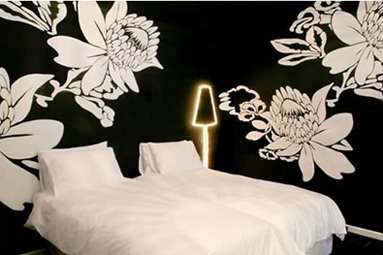 A really great place to stay in Cape Town is the Daddylonglegs hotel. A thirteen room haven for backpackers, this hotel feels like an extended trip to an art gallery. Each room representing a view into modern day South Africa. 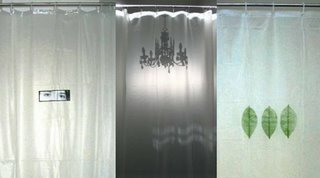 If you have the unfortunate situation where you have a plastic shower curtain to conceal your nether regions while you wash away the dirty day, there is a small glimmer of light at the end of your bathroom tunnel. These shower curtains from Catherine David Designs just might save you from your bathroom blues. There are some nice ideas and designs but nothing really ground breaking. Combining their fashion and graphic design backgrounds, Doris Ho and Mark Kane created a monster...well not really but they did create a monster T-shirt label. 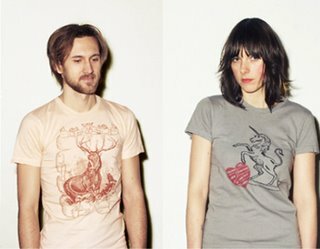 Beard & Bangs T-shirts are screenprinted by hand, leaving slight imperfections for the wearer to discover. 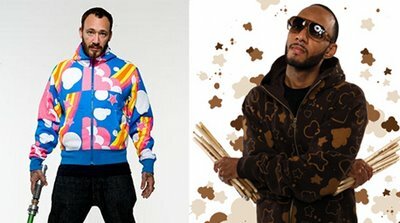 Some more pics from Kidrobots new clothing line which will be launched this Thursday at their revamped New York store. 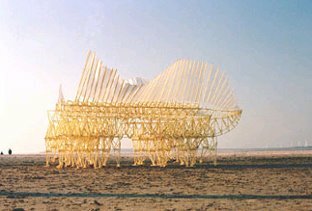 Theo Jansen creates these skeletal structures that move silently like centipedes across the beach. Constructed from light weight plastic yellow tubing, these creatures move with the power of the wind, slowly and smoothly. They are really amazing to watch! David Wiseman creates ornate beautiful pieces from ceramics, porcelains and metals. His work brings a much needed clean organic approach to the institutionalised look that many homes have adopted. 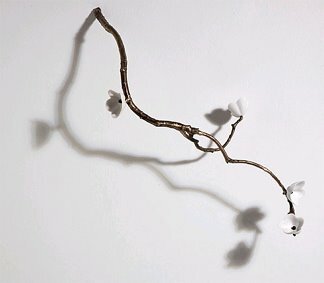 The bronze branch is accentuated by the delicate porcelain petals in his work wall decoration featured above. Davids work has is part of many collections including the National Design Museum. For the launch of the Volkswagen Fox, 21 artists from an array of backgrounds turned Hotel Fox into the world's most exciting and creative hotel space. Each room has been created beautifully, representing that particular artists style. 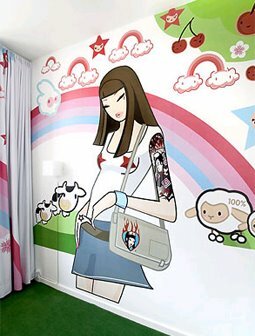 My favourite room is the one by tokidoki. Tokidoki, for those who don't know, means "sometimes" in Japanese. I think I actually love all the rooms equally. From Paris comes a very innovative and inventive clothing label sold through le bouclard. Artysm has just dropped some new hoodies, featured above, into their retails outlets. Their entire collection is a sort of cut and sew, t-shirts with hoodie pockets, t-shirts with hoods and all kinds of crazy combinations that are really cool and really expensive! I really think this is a novel idea, using left over materials from city municipalities to create a hotel with a difference. Situated near the Danube in Ottensheim, dasparkhotel was created for travellers that require a quick stop off in one of these nicely styled pipes. Just one thing...what happens if it starts rolling? 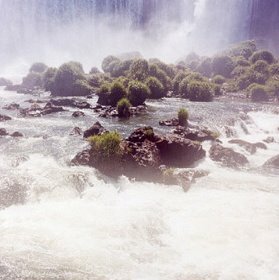 Brazil is the land of dance, sun and a big jungle called the Amazon. 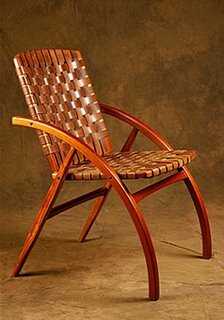 Carlos Motta has spent the last 30 years handcrafting furniture out of reclaimed materials and hardwoods. Motta lives a laid-back lifestyle which includes surfing, hippie lingo and carpentry. His creations are extraordinary and definately worth checking out. Aura incorporated seeks new techniques and materials to create products that have universal value and longevity. Many of their designs are from the 50s and the 60s and recreated to reflect modern values. 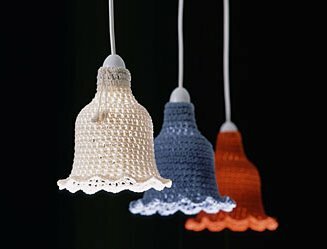 The lamp featured is a really great example of their japanese heritage that shows in their design. 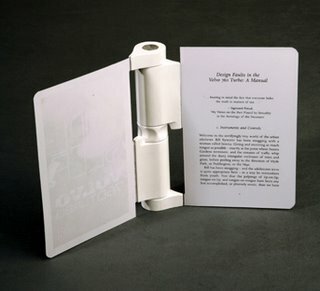 The E-reader concept, is a brilliant idea from student Timothy Yeoh. His concept uses two traditional aspects of reading, turning the page and folding the corner on the touch screen to keep your place. The screen that you rotate around the back refreshes to the next page in your book or magazine. Simulating the whole book. The scroll wheel lets you easily flip to the desired page that you require to continue your read. Brilliant! Barcodes are found on virtually all products world wide. Coded with information about those products. So who says they have to be ugly? Design Barcode doesn't think so. They have been designing barcodes for Japanese products recently and are set to boom internationally! 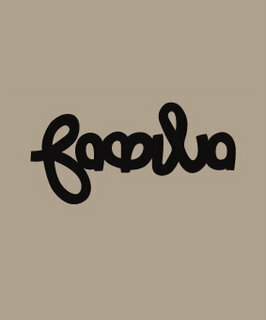 Familia is a South African Skateboard company run by skateboarders. In my opinion they have had some of the sickest deck designs around. They have recently dropped their new range of decks that have some amazing talent on their down unders. Their team riders include, Adrian Day, Gavin Morgan, Mark Donaldson and Clint Van Der Schyf. My favourite T print is the one legged pigeon on gray. 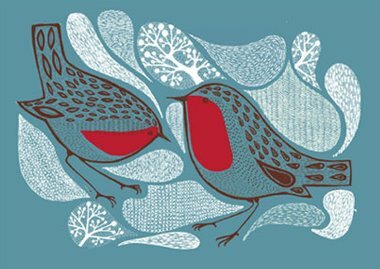 Susie Ghahremani is a jill-of-all-trades and one of the better illustrators that I have come across. 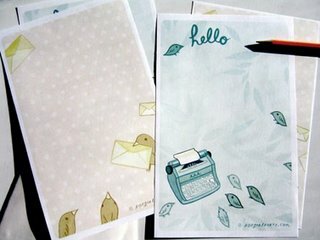 She does really great work that is applied to office and home stationery, which is sold through her site. Real pretty bits and bobs. While browsing I discovered this cool but pointless site about the history of the button. Specifically the history of interaction design through the life of the button, from calculators to websites. While the media takes our space , dumb us down and impedes our productivity, Good Magazine exists to add value. Founder Ben Goldirsh sees a growing number of people tied together not by background, circumstance and age, but by a shared common interest. A very cool innovative concept that has loads of potential. Their first issue has a Good article in it titled, America In The World. No, not what you do in the bathroom, but an innovative stationery collection from Knock Knock. No. 2 is all about office convenience, ranging from notepads to filing clips. Real simple and really easy to stay organised. 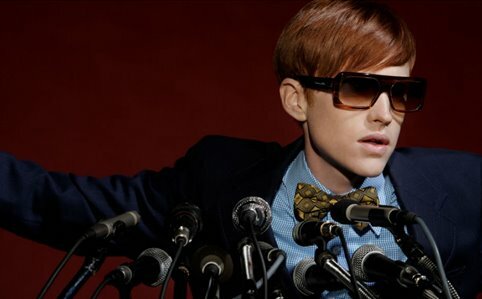 Look at these amazing sunglasses from Karen Walker Eyewear. The colour and shape are really perfect, and hits the nail on the head for my taste in eyewear design. Truly fantastical for that bright and shiny day strolling down the promenade. Go see the range. Wall and all. 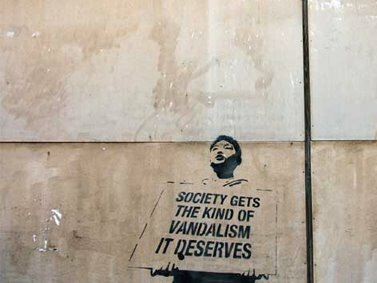 Walls are fast becoming a space for more than just paint, but this is not new information. 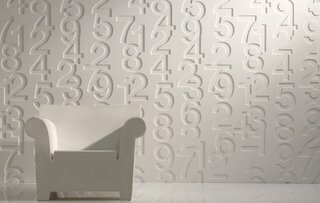 The helvetica wallpanel is a good example of how to use this space effectively, maybe even for a learning/homework room in your house. The panel just makes you wanna slide your hand over them doesn't it? Pantone is known for their colour and their fat swatch books that designers all over the world page through everyday. They are now attacking the world of interior design and home decor by adding a Pantone paint range to their arsenal. Slide here to check it out. 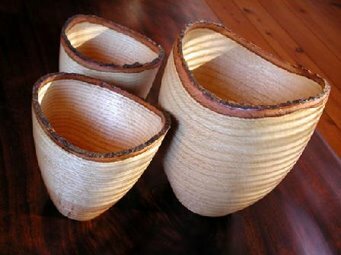 John and Andrew Early are famous in the Midlands of Kwazulu Natal, South Africa for their love of wood and creative art of turning. Their work is awesome and has received international acclaim. The contemporary dimension they have given to their bowls has been enhanced by Andrews diploma in architectural draughting. This is definately so hot right now. Kidrobot and Jamie Hewett have once again joined forces to create more figures for the animated band the Gorillaz. They are going to be available in soft vinyl and initially in 3 different colour variants! The CMYK Edition is available on the 26th October, the White Edition in November and the Two-tone Edition (limited to 1000 sets) in late November. Each figure will range from 6 to 8 inches in height and comes in unique boxes. Kidrobot is also starting to launch their own clothing label, so watch this space. The crochet lampshades are a perfect addition to a childs bedroom or study. 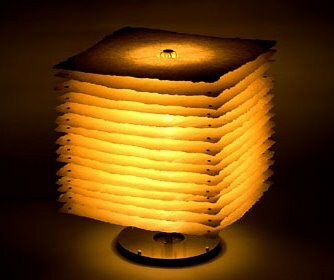 Thorsten van Elten is the designer behind the lampshades and many other quirky objects on his website. 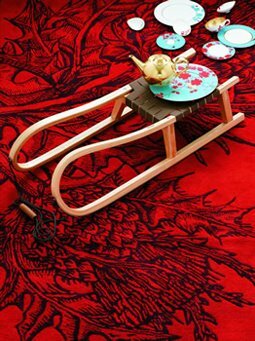 From furniture to some cool plates and mugs for kids. According to Shin Azumi, when we open a window a room is filled with air and the world outside has entered your space. In a similar way, turning on a radio, links us with the world around us. 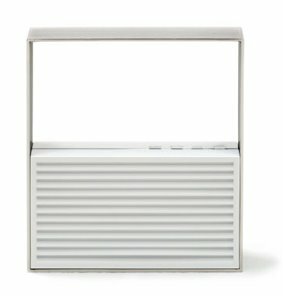 Shin created the Radio=Window out of steel and plastic to transmit his concept. Visit the Shin Azumi homepage for more of his personal work. Timorous Beastie is the designer behind the Thistle, originaly a wallpaper design, this rug would be perfect for my "man den" which I am collecting pieces for slowly. Check out the rest of the rug designs, there are some nice ones. Milan is famous for its street culture and fashion shopping lifestyle. The glitz and the glamour and the filthy rich. If you look past all the exterior bling, inside Milan you can find a few absolute gems. Lula Cioccolato is one of these diamonds in the rough, offering tasty takeaway chocolate treats. 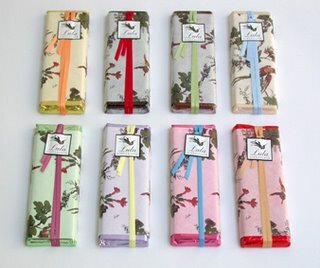 The packaging is great and was sourced and designed by owner Antonio Ponte. So...Earl Grey. This first Earl Grey flavoured white tea has a light refreshing taste. 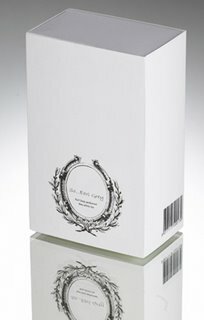 This beautiful light refreshing packaging just compliments the great tasting tea. Finest Tea No. 57 hand picks the most delicate buds to collect 80 000 tea leaves to create 1 pound of tea. White tea is a healthy detoxification tea. A box will set you back about R100. "Back in the good 'ol days..."
I have had a small crush on 50s appliances for a long time, and I don't know why. Maybe it is the super kitsch colours or the cheesy ads that campaign these appliances. 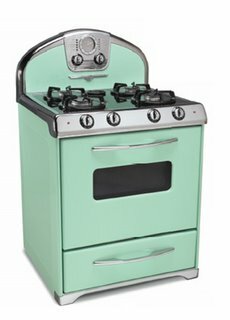 The Northstar range from Elmira Stove Works has some really great examples from this era that can be installed in your home today. The stove is my favourite, with the fridge a close second. 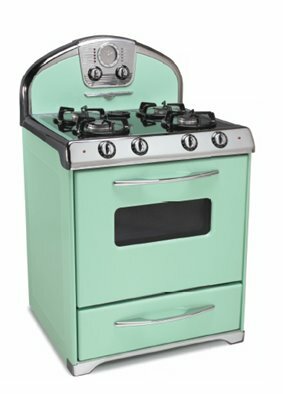 Maybe the 50s is just a phase for the early parts of the 21st century, but I think the quirky colours and dashboard-like design on the stoves will be great in any home. The obvious choice for a post today would be the new Apple iPod Nano. 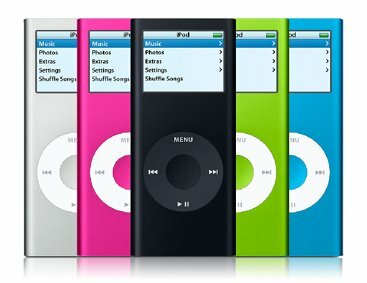 Thinner, colourful and with a brighter screen, the new Nano is set to make a huge dent in the worlds pocket. I want one now! Don't forget to check out the new Shuffle as well. I always like promoting South Africa and her famous talented children. Koto Bolofo is no exception, having been born here but based in Paris. Koto, a photographer, has taken for publications such as Vogue, Marie Claire and Vanity Fair. Some of his advertising clients include Banana Republic, Hermes, Levi's and Burberry. He has a really good portfolio, go check it out. This is a design manual. A design manual with an urgent call for artists, designers and communicators to re-engage with the world. This is Design Anarchy. 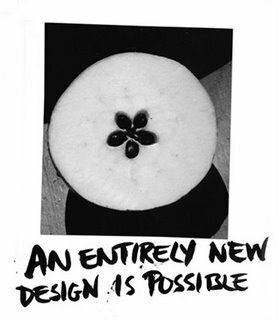 Created by Kalle Lasn, founder of Adbusters, this book probes the roots of commercial design culture and its impact on society. That was the nutshell version, but Design Anarchy is a must for any designer. On the link, click the Look Inside icon to get a great hi-res sneak preview into this must-have book. 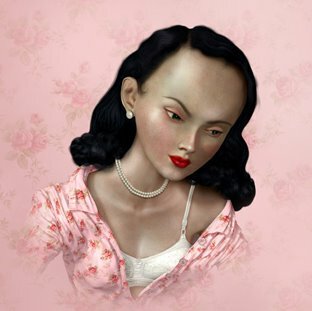 Ray Caesar has some incredible work, a little weird maybe but he should still be considered a master of digital shape. If you don't like his work then read his Biography, it is...well let's just say a little different. It made me laugh a little. Madewell was created by the man who was the CEO of Gap, and later joined J.Crew. His name is Millard Drexter. Madewell is a store that could be related to the a wallflower at the school disco. Beaming with enthusiasm, but is wearing that brown 70s suit his dad got married in. 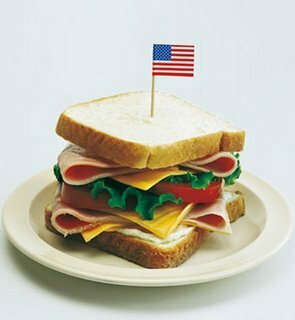 Because of this Madewell stands out like a sore thumb amongst the Abercrombies and FCUKs. It only stocks ladies Dawson Creek type clothing but in a weird way it is really great stuff. Their second store just opened. Another designer from the Pocko agency, Carolina Melis is an amazing designer and illustrator. Do yourself a favour and hook on to her website. Great work. I love it. While browsing Alice Stevensons work featured in the post before, I linked to Pocko. Pocko is a collective of designers, photographers, artists and illustrators. 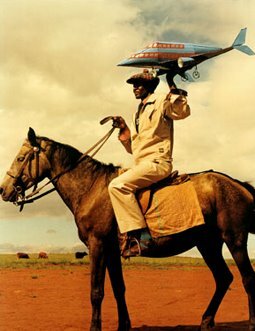 Amongst the Pocko People I found Ichiro Kono, a really cool photographer, amongst the lists of really talented people. I like his use of desaturated colour and bright light in his work. After my daily dose of design*sponge I had to blog Alice Stevenson and her really amazing illustrations. She is based in th UK and when you have the time, her portfolio is really worth checking out. This great concept stool is clever, environmentally friendly product design. These stools can be used as a single seat or as two. They were designed by David Graas, a dutch product designer. 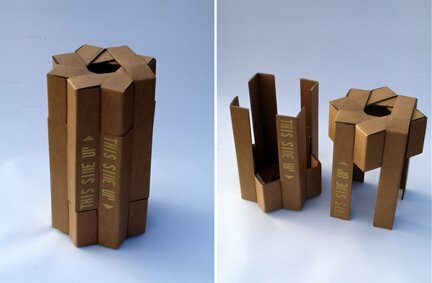 Cardboard boxes are very quickly discarded, but this proves that looked at in a different light, these innate objects can become objects of desire. 100% wool flannel with an overlocked stitch. 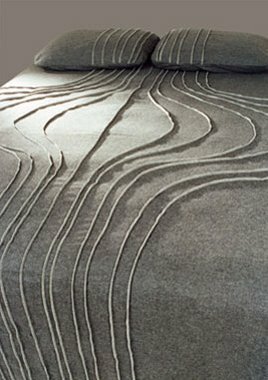 The Onion bedspread is available in all bed sizes for platform or boxspring beds. I really love that grey. 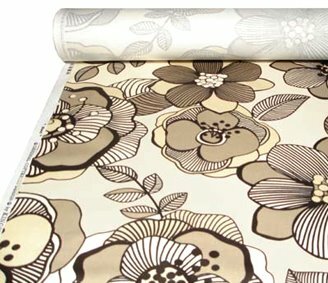 The design comes from Fold Bedding, a project started by Max and Linda Geiser, specialising in textile design, illustration and architecture. Their designs are sophisticated, monochromatic and textured. 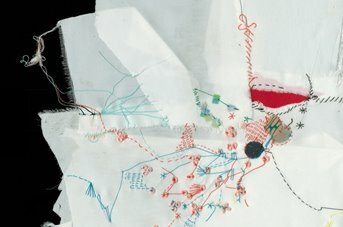 Using stitching as their accent. 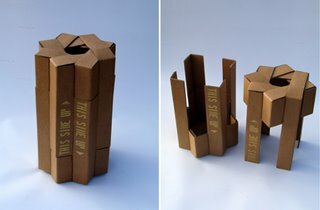 Binvention, from Sprout Design, is a great idea for a recycling bin. It uses old shopping packets seperated by the bins hooks, so that you can throw away your items seperately. 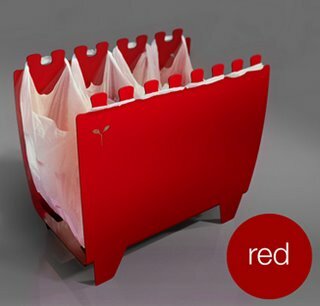 You can collect cans, bottles and papers in bins that come in 4 colours. Helping you help the environment. Best bit...there are only 125 bins in this limited edition. Polder refers to the land reclaimed by the Dutch, using dikes and drainage canals. The Polder Sofa is a low-lying, horizontal chair that has been constructed in carefully selected fabric and natural materials. Large buttons incorporated with high-tech threads accentuate the sofa. Joost Wever is a designer/lecturer of product development living in Holland. 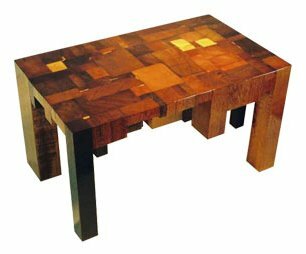 This table he designed was named after his home country and appropriately used local left over wood pieces, making each table unique. Each individual piece is varnished, creating a patchwork pattern of wood. Another one of his products that is pretty cool is the MoMag magazine rack. View it.